Man Behind Lens: Chef Wan Craze In Wellington! Chef Wan Craze In Wellington! There’s good news in store for Kiwis who know and love the bright lights, smells and excitement of the night markets so familiar throughout Asia. as part of this year’s Visa Wellington On a Plate festivities. 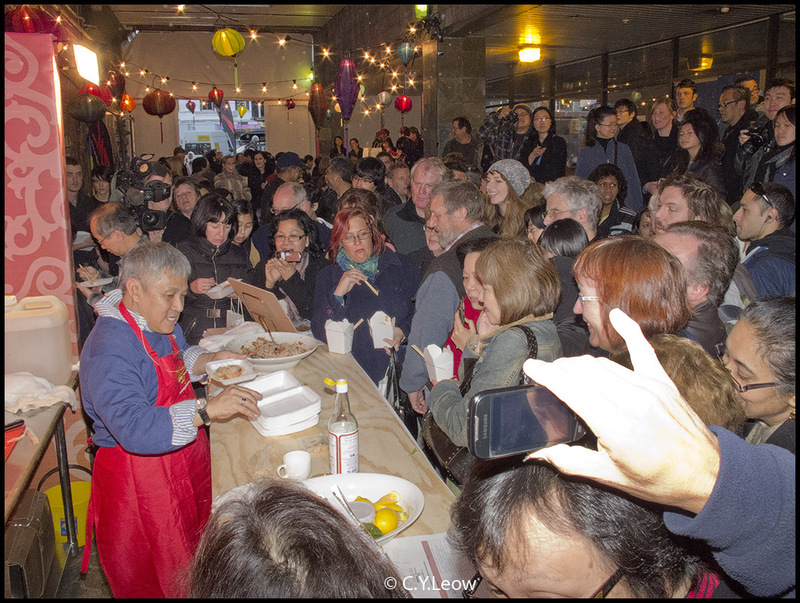 Malaysian street food produced by some of Wellington’s best-loved Malaysian restaurants. Asia’s most-loved celebrity chef and Malaysian culinary ambassador Chef Wan is also making a special guest appearance in NZ for the event. A household name in Asia with more than 20 years of experience in the industry, Chef Wan is a chef, author, actor, TV host, food critic and publisher. Pasar malam is a Malay and Indonesian word that literally means "night market", "pasar" being related to "bazaar" in Persian. A pasar malam is a street market in Indonesia, Malaysia and Singapore that opens in the evening, usually in residential neighbourhoods. It brings together a collection of stalls that usually sell goods such as fruits, vegetables, snacks, toys, clothes, shoes, alarm clocks, and ornaments at cheap or at least reasonable prices. Pirated DVDs, CDs and computer software are often sold at a pasar malam. A pasar malam often takes place only one to a few days of the week, as the traders rotate around different neighbourhoods on different days of the week. Haggling over prices is a common practice at such markets. 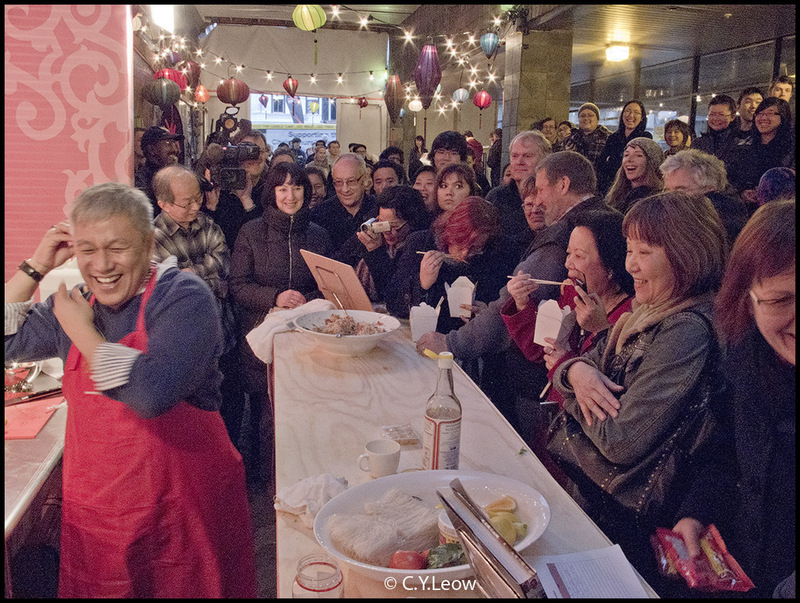 After a whole week of snow and freezing rain, the weather did a reprieve as if to welcome the funny and talkative Chef Wan from Malaysia! The Malaysia Night Market was schedule from 4 - 7 PM, we were there at 5.15 PM and was shocked by how jam packed the narrow Opera House Lane became! 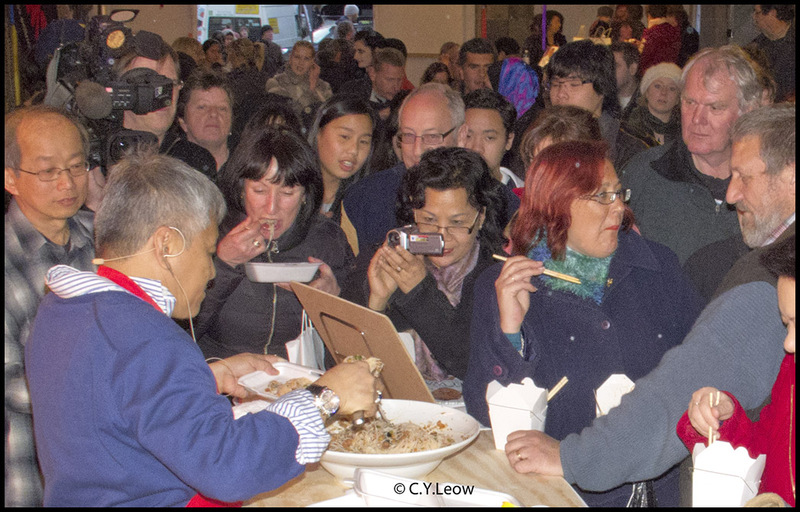 I think all of the Malaysian Malay community in Wellington are there to see Chef Wan. You can hardly move through the crowded lane and ordering food from the five or six Malaysian food stalls along the lane was a nightmare! I managed to squeeze pass the long food order queue, all the pictures were taken with my Canon G12 with an external Sunpak flash. I have to raise the G12 overhead for all the shots. 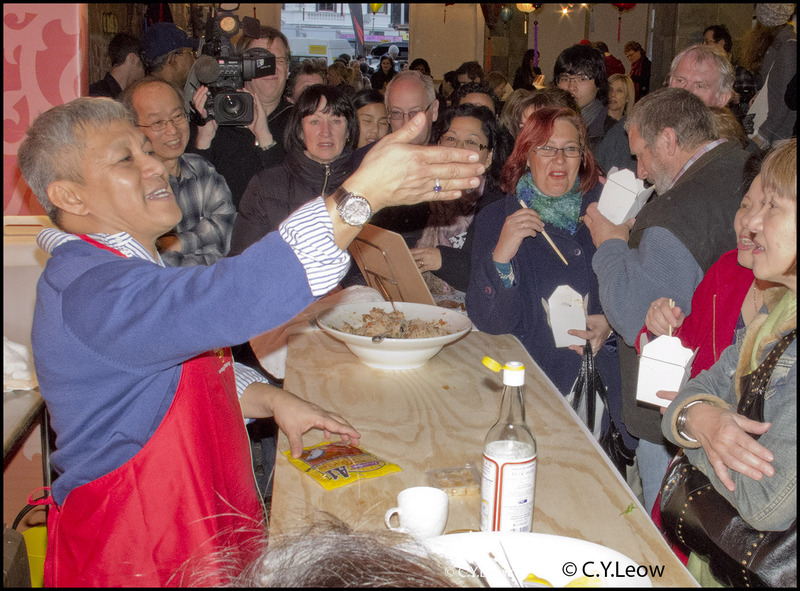 Chef Wan was demonstrating a quick "kerabu" rice noodle, which I thought was more Nyonya; but then Nyonya is an important part of Malaysian food culture! My Sunpak flash failed to fire! This picture was nearly pitch black, thanks to Photoshop the RAW image was lighten up to useable level. Did you know in an interview in February 2010, Chef Wan highlighted that he is of mixed ancestry; his father has Riau Malay and Javanese ancestry while his mother is of Nyonya and Japanese descent. Chef Wan has two children, one of whom is Serina Redzuawan, an actress who has appeared in several Malaysian drama series. Chef Wan's son, Muhammad Nazri bin Redzuawan, is following in his father's footsteps by becoming a chef as well. Chef Wan distribute his creation to the waiting crowd. 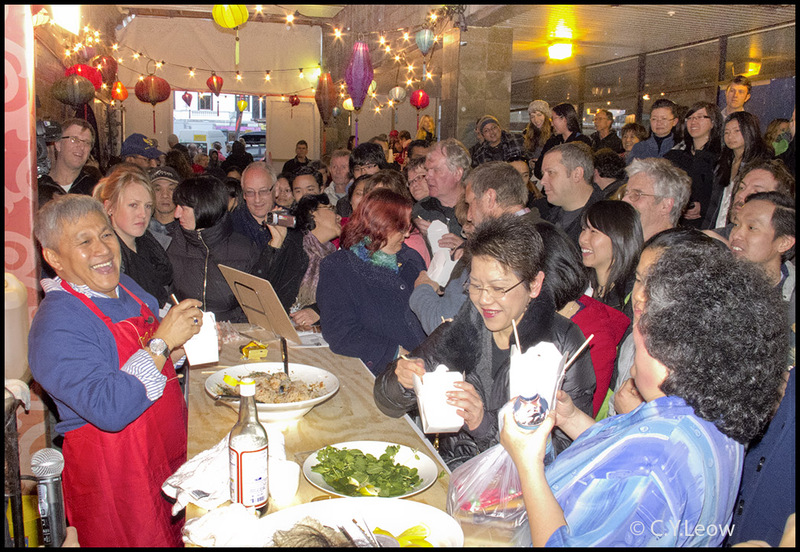 Was the Malaysian Night Market a success? Personally I think the narrow and cram venue turn away a large number of visitors! Look at this picture again, it is so crowded that you cannot even take a proper picture without someone sticking his freaking cell phone in your view! I don't know about you, but I am GETTING OUT OF HERE!! Getting feed back from my friends after the "Night Market", I get nothing but complain! Mind you, the complain mainly came from Kiwis; the targeted audiences this "promotion" was aiming at! One of them said they cannot even get any food after waiting in the queue for 50 minutes! Another complain there were no where to eat their food once they get them. Most, however; felt it was a half-hearted promotion by the Malaysia External Trade Development Corporation (MATRADE). Take a look at the first comment that came in, NOT good for Malaysian tourism! "Yes this Market was very badly organised! We waited in a queue for food for about 45 mins then gave up! And where were the seats and tables to sit at? what Malaysian night market doesn't have some where to sit down!! It was so crowded in possibly Wellingtons grottiest Alley, and they can't tell us they didn't know it was going to be so popular , these things are always popular. 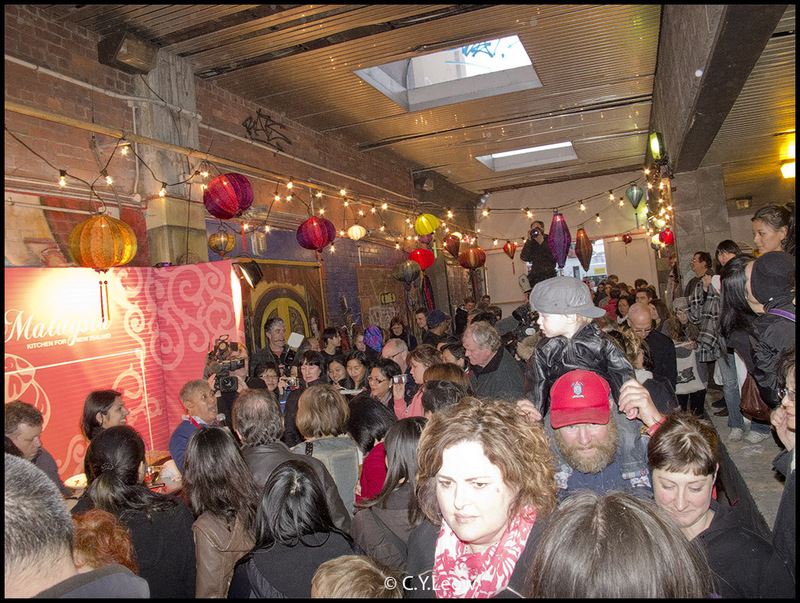 Maybe its time the council have an area set up for a permanent night market!" Yes this Market was very badly organised! And where were the seats and tables to sit at? what Malaysian night market dosent have some where to sit down!! It was soo crowded in possibly Wellingtons grottiest Alley, and they cant tell us they didnt know it was going to be so popular , these things are always popular. nice photos.Chef Wan looks every bit the "galloping gourmet"" that he is. Shame about the venue. Bad foresight and planning. It could have worked out well if they had planned it better.We were thinkning of going to buy our tea there, Just a well we didn`t!I don`t fancy the idea of standing in a queue for 45 mins to buy food! What do you mean by Malaysian malay community in wellington.I don't see any malay community but there were other Malaysians. Chef wan dont need Malaysian Malays to see him...all Malaysians welcome. My wife and I were on our way home after arriving at wgtn airport, when we heard the pasar malam being advertised. Yes, it was chaotic, there were tons of people, and it seemed disorganised. And yes 45mins+ was too long to wait to get food. But good on you for organising it, and hopefully, the wait will be much shorter next year. Whilst waiting, I took the opportunity to strike up a conversation with a fellow "queuer", who turned out to be a food journo from Dish, I can't remember her name, but the "wait" ended up being an interesting & enjoyable experience ! Well done guys, see you next year ! Yes,it was "good on them" to organise it, but I find it hard to believe after all thaose months of planning they don't realise the "grotty alley" is not a suitable venue and for WCC to approve it! My wife and I waited in line for 60 minutes to get a dish of roti chanai and chicken curry from Raja of Kayu Manis. It is no surprise that this was a badly organised event with only 4 or 5 stalls? Where was the night market apart from the lovely lights on the wall.